Dog Entertained by Flying Carrots… Wait, What? May 23rd each year is World Turtle Day. The month of May was selected because it’s the time of year that turtles emerge from winter hibernation and begin thinking about dating, mating, and nesting. “Ectothermic animals derive their energy from external sources; they cannot move quickly at low temperatures. This makes them poor foragers and puts them at high risk of predation. To cope, turtles find a safe, thermally appropriate hiding spot -- or hibernacula -- and reduce their metabolic rate drastically. This reduces their need for food, and causes them to enter a state of hibernation. World Turtle Day was introduced in 2000 by the American Tortoise Rescue, a turtle and tortoise advocacy organization whose mission is to bring awareness to turtle conservation issues. “‘World Turtle Day was started 12 years ago to increase respect and knowledge for the world’s oldest creatures. These gentle animals have been around for about 200 million years, yet they are rapidly disappearing as a result of the exotic food industry, habitat destruction, and the cruel pet trade. Sea turtles – all seven species – are among the most endangered animals on Earth according to the Humane Society of the United States (HSUS).3 Among the greatest threats to their existence are industrial fishing operations, including longlining and shrimp trawling. 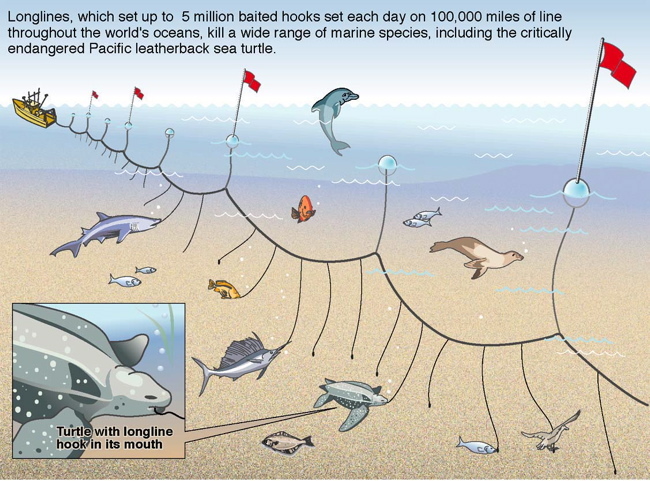 You can see from the pictures at the links how easy it is to either hook or ensnare sea turtles with these fishing methods. Sea turtle nesting areas are rapidly disappearing due to encroachment by beachfront residential and commercial development. And sadly, though many local, national, and international laws are in place to protect them from trade, turtles continue to be hunted for their eggs, meat, and shells. Turtles are the most popular reptiles to keep as pets, and at least 1 million US households include one or more turtles. Unfortunately, this trend isn’t a good thing for the animals. Collection of turtles for pet trade has impacted wild turtle populations in this country and across the world. According to the HSUS, captive breeding doesn’t solve the problem because thousands of turtles perish during capture and shipping, and thousands more that survive the trip subsequently die from inadequate care. Turtle species across the globe are also endangered thanks to their use as food and traditional medicine. Turtles in these trades aren’t even viewed as living creatures. The US is a huge exporter of freshwater turtles to Southeast Asia, in part because wild turtle populations there have been devastated by over-collection. Thankfully, some US states have passed laws prohibiting the commercial harvesting of freshwater turtles. An additional serious threat to all turtle populations is loss of habitat. In the US, coastline development projects reduce nesting habitats for sea turtles. Discarded trash such as plastic bags cause suffocation, strangulation, and blocked digestive tracts in turtles. Pollution, including hazardous chemicals and garbage, also impacts turtle habitats and causes illness and death in land, freshwater, and sea turtles. In the Great Lakes region, deformed male snapping turtles are thought to be the result of chemical pollution, and young turtles in the area are showing other biological abnormalities. Estimates are that about half the green sea turtles off the coast of Hawaii are infected with the fatal disease Fibropapilloma, which may be caused by chemical pollution. On a brighter note, teenager Yawkey, a 500-pound leatherback turtle who was found stranded on a deserted South Carolina beach in March, was rescued and quickly returned to the sea. Yawkey, named for the Yawkey-South Island Reserve where he was discovered, required a team of five people to haul him off the sand and onto a specially built wood platform for transport to South Carolina Aquarium’s Sea Turtle Hospital in Charleston. Yawkey was treated for low blood sugar, exhaustion, and a possible intestinal blockage. Since leatherback turtles don’t do well in captivity, the aquarium staff wanted to release Yawkey as soon as possible. Within a few days of his rescue, the big guy was acclimated to cool water temperatures, microchipped, and released on a beach in Isle of Palms, South Carolina, where he cruised back into the ocean under his own power. Next Article Dog Entertained by Flying Carrots… Wait, What?